This article by Azlan Othman, was published in the Borneo Bulletin on December 4 ,2018. LOCAL companies are encouraged to export more of their products to move forward, as Brunei is still heavily dependent on imports according to the national import statistics report for 2017. Purchases of several types of goods – notably agricultural, fishery and food commodities – are particularly high. Speaking at the one-day workshop on current regulatory requirements in Brunei and across ASEAN at the International Convention Centre (ICC) yesterday, Deputy Permanent Secretary at the Ministry of Primary Resources and Tourism (MPRT) Haji Halidi bin Haji Mohd Salleh said that the government is also constantly reminding importers and exporters to always adhere to the regulatory control requirements for the import and export of food products. “This compliance is vital in helping the government prevent any harmful effects towards humans, animals and plant life in the area of food safety, and also in particular the local industries and economy,” the deputy permanent secretary said. Haji Halidi added that His Majesty Sultan Haji Hassanal Bolkiah Mu’izzaddin Waddaulah ibni Al-Marhum Sultan Haji Omar ‘Ali Saifuddien Sa’adul Khairi Waddien, Sultan and Yang Di-Pertuan of Brunei Darussalam has planned for progressive and sustainable economic growth for Brunei’s future generations through the Brunei Vision 2035 national development plan. Deputy Permanent Secretary at the Ministry of Primary Resources and Tourism (MPRT) Haji Halidi bin Haji Mohd Salleh in a group photo with the MPRT and AFBA officers as well as seminar speakers. 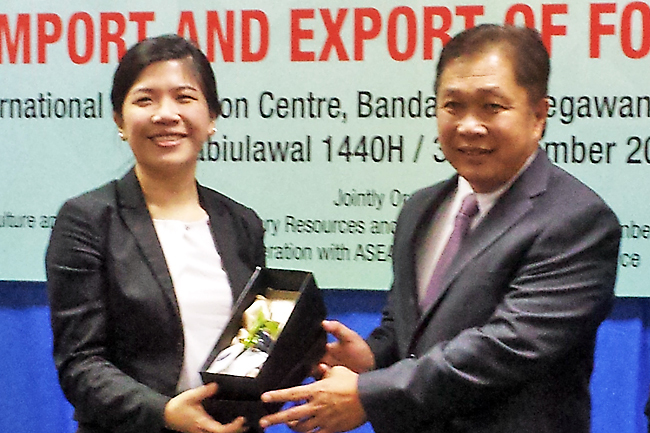 Deputy Permanent Secretary at the Ministry of Primary Resources and Tourism Haji Halidi bin Haji Mohd Salleh presents a souvenir to speaker from AFBA Teresa Lo. – PHOTOS: AZLAN OTHMAN. “His Majesty reminded us that our small domestic market should not be a hindrance to economic growth, and that every company be they private or government-owned should be able to sell their products and services to foreign markets,” he said. Brunei’s representative for Asean Food and Beverage Alliance (AFBA), Haji Abdul Halim bin Haji Saim, meanwhile noted that the roadmap for establishing a dynamic and sustainable economy is provided under Brunei Vision 2035. Within the various strategies under this economic blueprint, agricultural production and agrifood processing have been identified as priority sectors for the country. “At the National Chamber of Commerce and Industry of Brunei Darussalam (NCCIBD), we are constantly seeking opportunities to enhance the capacity of the local food industry,” Haji Abdul Halim said. “Besides strengthening the domestic food supply system, we hope for further expansion into the export markets for locally produced products. The harmonisation of standards and facilitation of regional trade are set as priority areas under the ASEAN Economic Community (AEC) Blueprint 2025. The ASEAN region has vast growth potential, offering member states attractive opportunities in the food industry. 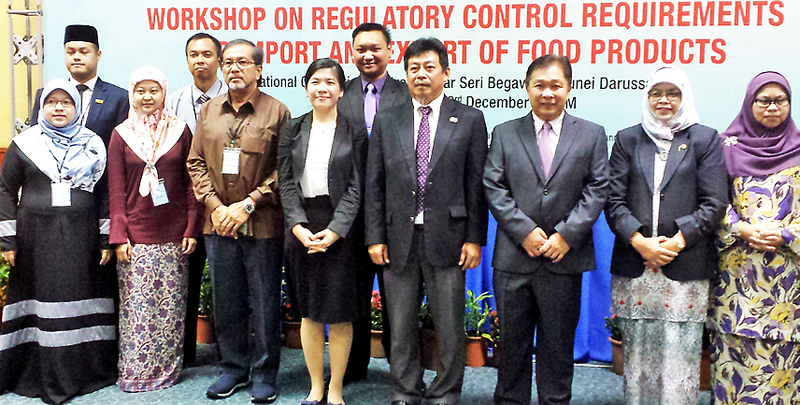 Organised by the AFBA, the Department of Agriculture and Agrifood of the Ministry of Primary Resources and Tourism, and the NCCIBD, the workshop’s goal is to help companies better understand the import/export regulatory requirements for the food industry in ASEAN, and provide them networking opportunities for venturing into export markets. Invited speakers at the event included officials from government agencies and representatives from the private sector. Some 140 participants attended the workshop, comprising representatives of local food enterprises from the agrifood and fisheries sectors, foreign direct investor companies, the Ministry of Primary Resources and Tourism, Ministry of Health, Ministry of Religious Affairs, Ministry of Finance and Economy, as well as DARe (Darussalam Enterprise) and Ghanim International Corporation Sdn Bhd. Also present were heads of departments of Brunei government agencies, the programme leader of AFBA, as well as managers and owners of local food companies. AFBA is a non-profit organisation established in 2013, with members comprising national associations in Southeast Asia in the food and beverage industry.